…that’s why they call it the present. So I was watching Kung Fu Panda the other day, you know, the movie about the Panda who is chosen as the “Dragon Warrior” who eventually learns the secret to limitless power and conquers the evil snow leopard, Tai Lung. It’s no secret that I’m a huge fan of things that aren’t necessarily the most popular choice. For example, I [still, to this day] listen to Britney Spears – not necessarily because she’s a great human being, but because she’s a great artist. Same goes for any “unpopular” music. I’ll have to admit at this point that I did like Simple Plan for a while – but only because I was into their style of music at the time. I can now proudly say that I no longer like them – but I digress. I do like children’s movies. Especially those feel-good ones that make you feel all warm and fuzzy inside. Take Over the Hedge, for instance. It’s about a raccoon who uses cunning to lure a small forest family to scavenge food with him, eventually leading him and the forest family into all sorts of trouble. Today is a gift because everything you do today matters, in some way or form. Pick up that trash, not because you’re too lazy to bend down and pick it up, not because you’re doing it to look ‘cool’, but because in someone’s eyes, you’ve just dropped a couple of points. Drop enough points, and you might just find yourself a nobody. Anyways, after all the stress of mid-year exams we have just been through, I’d thought I’d come back to posting something a little less un-stressful – the complete explanation to life as we know it. Just kidding – that’s far too immense a topic to be discussed here. Instead, how about we talk about how exams were? We can all let each other know how we went (results-wise) by the comments system here on freshbytes – sure, your results won’t be private, but you’ll be doing some sort of community service… I think. The weekend was a little stranger than usual – a bonfire and an 18th. Dean couldn’t manage to light the bonfire with 4 litres of petrol – as you do – and it took the dedicated team of two to finally light it about 15 minutes on. Nathan made an awesome sparkler bomb (some 97 sparklers) which sadly, I don’t have video of. I’ll see if I can scrounge a photo of it or the bonfire later on, and I’ll stick it up here when I do eventually find one. And Dean – not being able to light a fire when you had poured 4 litres of petrol on it? And then trying to light it again (this time, with more petrol) and almost blowing ourselves up? Lesson learned: petrol + fire is fun! Congrats to Shaun V for the 18 – hope your CRF (Car Replacement Fund) got a well-deserved boost. Meanwhile, I’ve left the best Radi8 digital scavenger hunt till last – my team. Of course, we won, but that was just to be expected! I’ve FINALLY learnt how to center youtube vids, so here it is – starring Adam v S, Benny L, Jillian H and Karla V doing some seriously insane stuff. What on earth were we thinking?! Enjoy. One last thing: I’ve lauched a new website. If you want to know the address, just talk to me at school, and try not to spread it around too much – thanks. Once again, enjoy – comments below. Too geeky for you? I thought so. It’s always struck me as a little odd that even though we’re getting more and more sun each day (as we’ve passed the shortest day of the year), the days are STILL getting colder! How does that work, because more sun should equal more warmth…but apparently, it doesn’t. Time to go, but not before one more video… This week on the Radi8 Digital Scavenger Hunt, it’s Dave O, Thomas v S, Angelo O, Eliot P and Wesley H as they buy 10c of petrol (this was back in 2007), singing Jingle Bells outside a supermarket, doing cartwheels in Kingston Town – you get the idea. Enjoy, and as usual, comments below! Ok, well here is a quick note for you folks. For all those who have played flash games at school/play them currently, I have found a nice little application for playing flash games. Yes, it is only for Windows (sorry Benny), but most people like to play games in the library, where this app is best suited for. Enjoy. YMMV, be aware of that. I can haz iPhone 3G?! No, you can’t have an iPhone 3G. Why? Because Telstra in Tassie don’t have any more in stock; they only received something like 200 of these units, and they sold out sometime on Saturday afternoon. …does anyone else see my problem?! 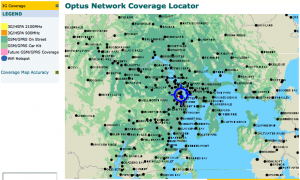 So even though Optus offer the best data plans out of all the three carriers who are selling the iPhone 3G, I can’t go with them because their 3G coverage in Tassie is non-existent. Buy iPhone 3G outright for $847 (16GB) and just use it with my current pre-paid SIM. I won’t have any data this way, but at least I’ll have 1c text to all Telstra mobiles! Choices, choices. I hate it how being Tassie makes us disadvantaged though lack of technology. 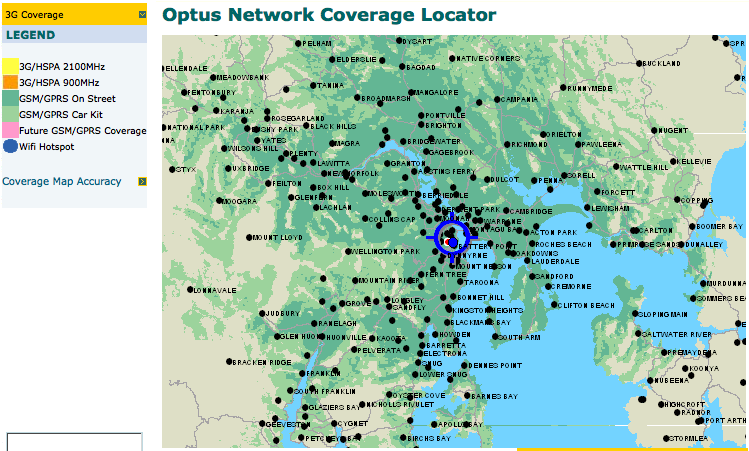 When a telecommunications has no 3G coverage in an Australian state, that’s just not on. Intelligent Island? Give me a break. Mark my works, while Telstra has the monopoly that it has over the telecommunications industry like it has currently, Tassie will continue to remain the most un-intelligent island. For example, it currently costs Internode (an Internet Service Provider) SIX times as much to ship data (through Basslink) from Melbourne to Tassie than it does for them to ship data from Melbourne to New York. Again, corporate Telstra screws the small guy. Telstra really is the epitome of a bloated telecommunications company. The things they do well – coverage – are more than offset by the things they do badly – price, service, value for money. But enough of Telstra and their corporate monopoly. Now, how about we talk about something else not-funny? 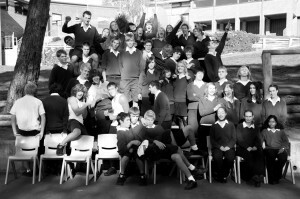 Something, say like the so-not-funny Year 12 funny photo? Picture after the jump – click on the link, if you don’t know what “after the jump” means. Here at freshbytes, I personally respect Facebook over MySpace any of the day, as I’ve outlined previously. So it’s not a big surprise, then, that we have built, brick by brick, the Freshbytes Wall. It’s that little piece of ajax-love in the top right hand corner of every page, that sweet widget that allows you to post your comments about the site, do shout-outs, and all that kind of funky stuff. You can additionally view all the comments on the Freshbytes Wall page, where you can also add comments – and they’ll show up on the Freshbytes Wall (and consequently, on every page)! Cool, huh? Radi8: We had the St Vinnies Ball this friday, and it was actually really good! Besides yours truly not making any effort what-so-ever to dress up, there were people there that looked fantastic in their St. Vinnies clothes, and then there was Adam… But really, it was a fun-filled night with the Life Dancers dancing to Greased Lightning, the Macarena, and many other great hits. It was excellent to see a few faces that I hadn’t seen before/had never seen before – I hope you continue to come to Radi8. There was one thing that was pretty amusing, though, and it was that with the exception of <8 people, the whole crowd was exclusively Calvin. I mean, really! Where are all you other teens going? Maybe to CrossEyed Youth? Anyways, as we Calvin-ers in Years 11 & 12 prep for mid-years, I encourage to tell one person about freshbytes, provided they don’t already know about it. freshbytes – the freshest bytes on the web, MUCH more than random zeroes and ones! One last thing, before you get too bored: The Radi8 Digital Scavenger Hunt video for the week! This week, it’s Dean T, Paul C, Emily L, Blair T, Simon J and Danny T in a fun-filled adventure where they sing in Kingston Town, scale tall buildings, do the leap-frog in Franklin Square, and where boys try on girl’s dresses… Enjoy! Guys, the Year 12 Funny Photo was a COMPLETE disaster. So not funny, not funny at all. Now I understand why they wanted to take the photos again, and Photoshopped the results… The lighting on that day was truly horrible. For those that are interested, Grace C-A is apparently organising a “real” Year 12 Funny Photo with Mrs Grice – see her for more details. Otherwise, enjoy the Year 12 Funny Photo. Or not. Hit the pic above to see a bigger version (works for every image on the site), or for those that want to download the full version (4MB), click here. Guys, VOIP is the word of the day. Get into it! If you have a computer with a microphone (USB or what-ever, doesn’t really matter) and speakers, you’re all set! All you need is a client (piece of software that lets you talk with other people all around the world – for FREE, all it uses is your internet connection) such as Skype, and you’re all set! To the NoSpoon crew, I know we use TeamSpeak for group chat, but maybe we should cut out the middlemand and get VOIP-ing. So get Skype, get a Skype name, and get chatting! My Skype username is “bennylingbling”, (without the quotes) so whenever you want to chat, I’ll usually be there. If I’m not, contact me by IM and I’ll be on Skype faster than you can say Voice Over Internet Protocol! Radi8, as usual, was awesome – the 4th of July meant that there was the movie Independence Day being shown. The games were based on Uncle Sam, so we had some US General Knowledge questions and a couple of other fun games. Unfortunately, Black Team didn’t win – we lost to some other team I can’t remember by either 4 or 6 points. On another note, the Radi8 website has been changed to incorporate a MySpace and a static (non-MySpace) page, where those of us who don’t have Spaces or Facebooks can see what’s going on – without all the extra crap that a MySpace usually has. And on that note, MySpace is utterly ridiculous. I don’t know how people can stand using pre-built, shocking-CSS themes, but they just, look, horrible! In this blogger’s humble opinion, MySpace has degenerated into a [insert derogatory word here]-fest of people who don’t know their Verdana from their non-repeating backgrounds. Facebook, on the other hand, is just an upper class version of MySpace – just without the crappy “custom layouts” and all that other junk. I really like Facebook, just because everyone uses the same layout, the design is clean, and there are cool things like “Walls”, “Pokes”, “Gifts”, and the insanely awesome Facebook chat. MySpace just pales in comparison. ANYWAY, after that mini-rant, it’s time for what you all came here for: the moral guidance/deep and meaningful. That stuff that makes the world go around, that wonderful, excellent stuff that so few seem to have, and yet long for in the deepest, darkest corners of their hearts… Or something. Now, I’m not one to be affected by change, but when it’s world-shakingly huge, I stand up and take notice. The 3G iPhone is a good example of this – it’s a device which has generated so much talk, yet has one of THE biggest pedalstools in the history of gadget-goodness. If it doesn’t stand up to be all that it’s hyped up to be, then Apple will take a huge hit because of it. However, there is one aspect of change that worries me – the fear of the unknown. That part that’s completely open to interpretation, up-for-grabs, and all that kind of stuff. You never know what’s just around the corner in respects to change – that new employee might be a complete clown who doesn’t know anything, or just generally not a very nice person. I think it’s up the individual in regards to how they deal with change – accept it and move on, or rant continually on a small blog that they have… You can see which path I have chosen to take, ya? There was this event on the weekend that I wasn’t invited to. Sure, I was just a little, tiny, tiny cut, (my ego did take a hit) but then I realised that it didn’t matter that I wasn’t invited. I had been to the ‘event’ two years ago, and yeah, it was awesome, but in that two years – mate, so much has changed! I know I’ve changed, I think that other people have changed, and people just aren’t the same as they were. This time, it’s Emily J, Lyndsey H, Hannah M, Rachel O, Lucy O, Laura V and Rachel W doing some crazy things, examples of which include: singing the National Anthem in front of a public Australian flag, breakdancing on a cardboard box, cartwheels on the beach, walking out of an elevator backwards, and some other crazy things… You’ll just have to watch the video.